The old Watch Room at Wellington Fire Station with its new console control room with a 1950s fire engine in the bay. 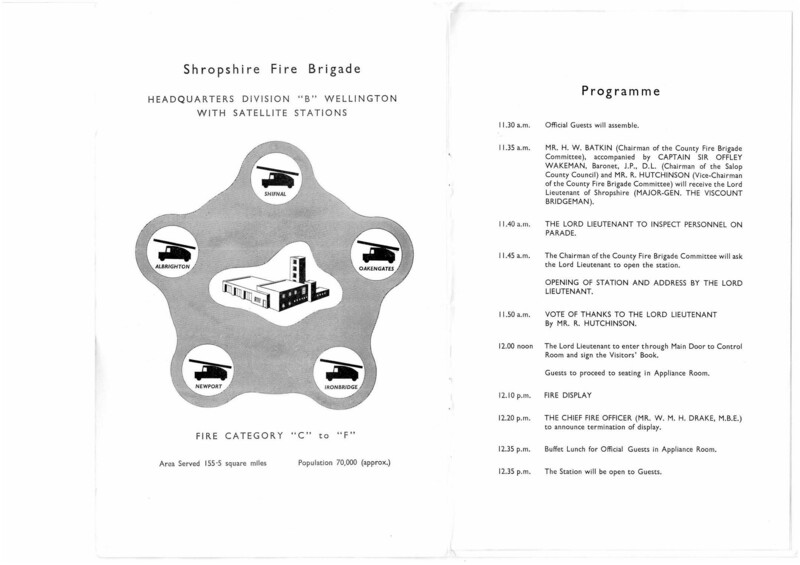 A member of The Fire Brigade Society had found the original programme for the opening of Wellington Fire Station in 1953 on the internet auction site. “It was too good an opportunity to miss,” said Richard Hickman, The Fire Brigade Society's West Midlands Administrator." “We soon realised the 65th anniversary was rapidly approaching and given the good relationship the society has long enjoyed with Shropshire Fire and Rescue Service, we felt this would be a nice way of giving something back for all the help and support we have received over the years. “The station on Haybridge Road, opened at 11.30am on May 22, so it seemed like the right thing to do, to return it to its original home. “It is all the more poignant because for many years the Society’s point of contact with Shropshire Fire and Rescue Service is Station Officer Craig Jackson who had served at Wellington in a number of roles,” said Richard. Station Officer Craig Jackson is now organising anniversary celebrations replicating, as far as possible, the original programme. Wellington Fire Station in Bennett’s Bank was then surrounded by open fields planned to become playing fields for a future college. It was built as the headquarters of B division, which included satellite fire stations at Shifnal, Oakengates, Ironbridge, Newport and Albrighton serving a population of 70,000 covering 155 miles. Older fire stations at Foundry Lane and Donnington Wood were closed as a result. The new 1950s station, was constructed with all modern fittings of the time including alarm bells “working off mains voltage,” a modern console control in the watch room, folding bunk beds and a dormitory for ten with access to the muster bay by a steel pole drop. It was officially opened by the Lord Lieutenant of Shropshire, Major-General Viscount Bridgeman, who inspected firefighters on parade before watching a fire display. VIP guests then included Chief Fire Officer Mr W.Drake MBE, Salop County Council Chairman, Baronet Sir Offley Wakeman and County Fire Brigade Committee Chairman Mr H.Batkin. “We will try and copy as far as possible to replicate the opening celebrations with invited guests, a demonstration from our animal rescue unit and a tour of the station,” said Craig. The Fire Brigade Society formed more than 50 years ago for anyone with an interest in the fire and rescue service including incidents, stations, appliances, mobilising, personnel, manufacturers, private, military and works brigades from a historical perspective through to present day operations. The society, run entirely by volunteers, has around 600 members from all walks of life including a number of active and retired emergency service personnel, along with members abroad and arranges organised fire service visits each year and publishes its flagship magazine Fire Cover.